Map of Pimmit Run Trail – Section 3: Bryan Branch Rd. to Olney Park, McLean, Virginia; created using National Geographic Maps/AllTrails, alltrails.com (interactive map); view this trail also on Map My Hike. Of course, this 3.8-mile stretch of predominantly unpaved track can be started, with little real consequence, from either end: Bryan Branch Road or Olney Park. Chasing the source of the creek in Pimmit Hills, this description, however, will follow Pimmit Run upstream. Parking at Bryan Branch Road is a bit unorthodox, as the trail technically starts within the grounds of private Highlands Swim and Tennis Club (as the signs display proudly, home of the “Whomping Turtles”?). A short distance up Bryan Branch Road (see map)—situated off Linway Terrace Road—a usually open gate nonetheless is intended to restrict entry to “members and guests only”; no matter, there is free parking on the left shoulder just outside the gate. It’s about 1/3 mile walk up the road to the start of the trail, located just left of the private parking area at the club. Look for an obvious wooden bridge and a sign with a map of Pimmit Run Stream Valley Park—this is the start. The trail begins by quickly traversing Bryan Branch, a modest stream carrying relatively little volume. 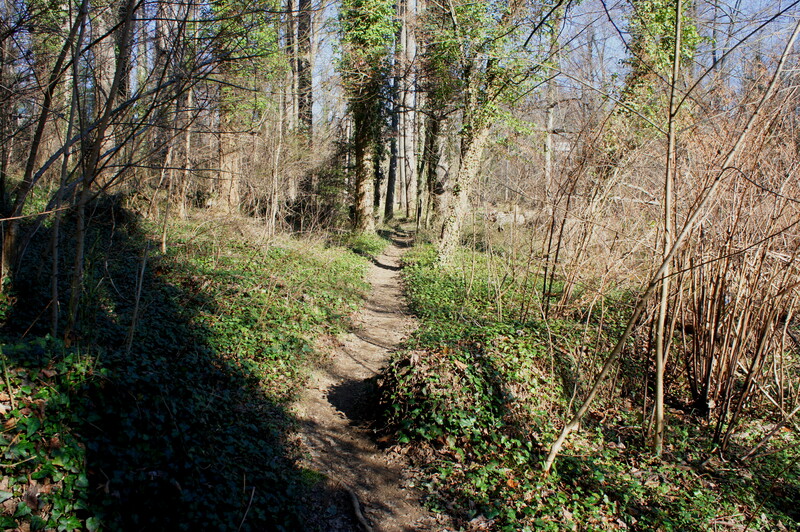 The singletrack then cuts north through an ivy-laden forest, reaching Pimmit Run after a couple minutes of walking. Bear left as the trail approaches the creek. Pimmit Run at this point is still but relatively deep; as of January 2016, one bend boasted a depth of around 3-4 feet. Around ¼ mile from the start, hikers pass under a set of telephone lines; the trail will roughly follow these mild eyesores for much of the walk. 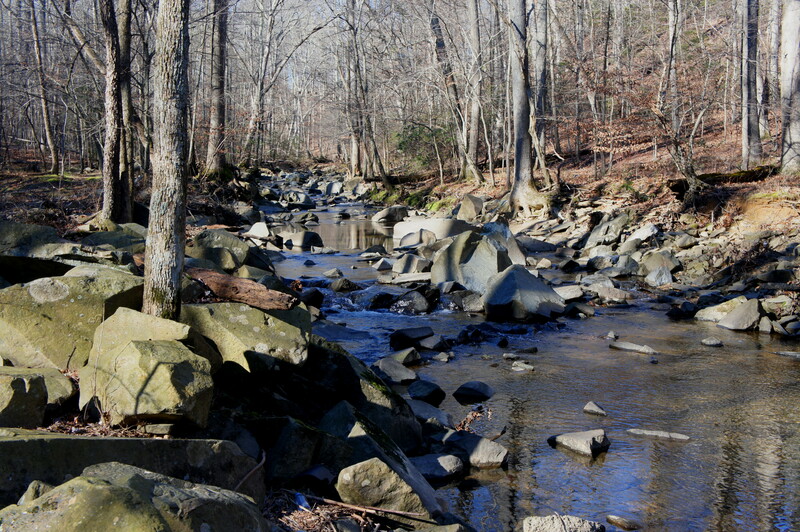 Shortly thereafter, a small channel, occasionally filled with water, appears on the left, and the trail is briefly lost amid a jumble of rocks before bending northwest. This is a delightful section, as the trail distances itself (to some degree) from houses on the left while Pimmit Run gains some oomph. Atop a hill on the opposite bank lies a spectacular house with a spectacular view. Six-tenths of a mile from Bryan Branch Road, the trail forks; bear left. Steps later, the trail splits again. A left turn leads to a small parking area on Brookhaven Drive, while the main track continues right. The first Pimmit Run crossing is encountered seconds later; stepping stones assist with the traverse. Heading southwest toward Old Dominion Drive, it’s easy to miss a split in the trail that is marked on some maps. Following the telephone lines straight across a grassy meadow, however, avoids two rather unnecessary creek crossings and quickly meets up with the main trail after 1/10 mile. The end of the open field is bounded by a peculiar stand of non-native bamboo stalks, one of several along the length of Pimmit Run. 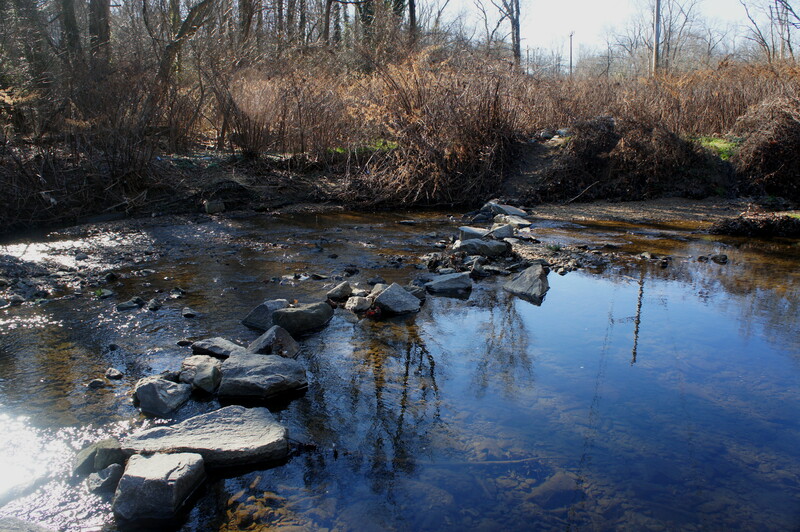 This is followed by another creek ford, this one at least 20 feet long and again supplemented by well-placed stepping stones. A final stretch weaves through brush before emptying out onto a paved path running roughly east-west. Take a right, crossing Pimmit Run (this time by bridge), then climb to a break in the metal railing astride Old Dominion Drive above. Here a crosswalk guides hikers to the other side. The second subsection traverses a boggy section of the Pimmit Run floodplain and includes a wide curve to the west to avoid a particularly muddy section. About 1.4 miles from the trailhead, the route passes under another string of telephone lines (and over a relatively manicured lawn that is basically an extension of a McLean resident’s backyard). A few minutes farther, the singletrack cuts sharply east to clear Pimmit Run, this one a relatively easy and shallow crossing. From here it is a short walk along the east bank to Old Chesterbrook Road. Up at street level, bear right, passing to the right bank of Pimmit Run before cutting south to the continuation of the trail, marked by a convenient map of the section ahead. Here you have entered Kent Gardens Park, a serene and peaceful patch of green in the heart of McLean. For 1/3 mile, the trail roughly follows Pimmit Run, defined in this area by deep cut banks, shallow waters, and pebbled beaches. In one of the trail’s stranger mysteries (second perhaps to the bamboo), the path makes an abrupt and time-consuming bend around a minor tributary of Pimmit Run—constructed perhaps because of the difficulty in finding a spot to reinforce a bridge (or to ease the slope for mountain bikers). By mile two (of the total hike), the route reunites with Pimmit proper, and walkers are greeted with a three-way fork. Resist the temptation to bear left across the bridge (this mistake is reflected in my Map My Hike); the southbound path continues straight. The next half mile is very straightforward, as the trail bears southwest on a line between the creek and a series of residential backyards. 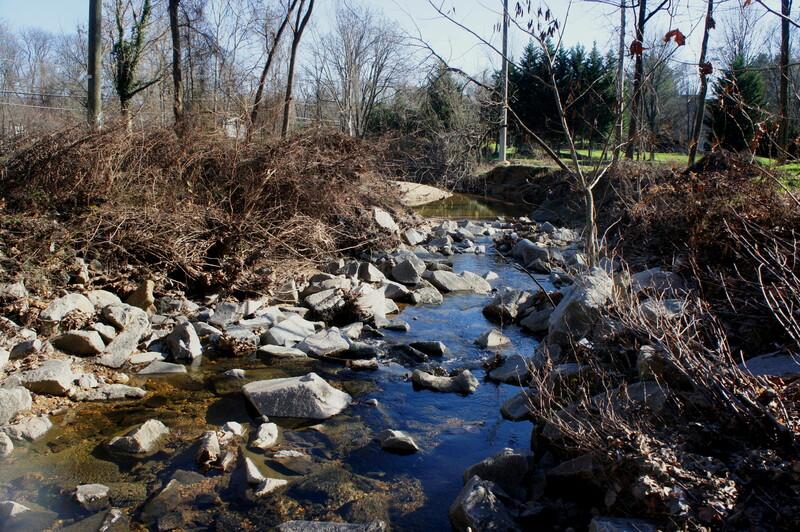 There is no Pimmit Run crossing in this section; the route simply climbs to the curb of Westmoreland Street at a point about 2.6 miles from the trailhead. Westmoreland Street can be a busy road, so hikers may want to use the crosswalk a few dozen yards to the right. The trail continues on the same (west) side of Pimmit Run, dropping down ten wooden steps before settling again into its standard disposition: straight and level. Nonetheless, this section feels noticeably different; Pimmit Run has significantly narrowed, and a clutch of baseball fields dominate the landscape to the east. Shortly after the baseball diamonds end, the route passes a second dense bamboo grove then crosses Pimmit Run (via concrete stepping stones). 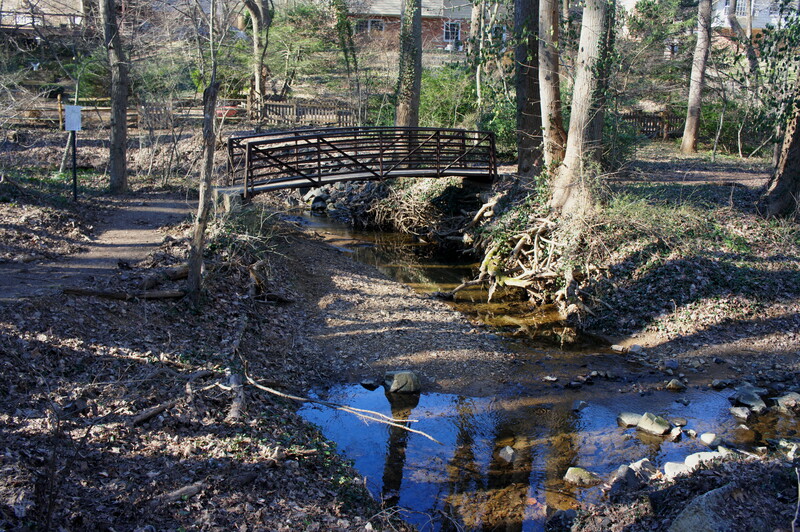 The remaining 1/3 mile to Great Falls Street weaves through woods and over a series of minor wooden and steel bridges. The final section begins across the road and a little to the right. Clear a set of wooden steps over a metal guard rail, then follow the (asphalted but all but defunct) road—interrupted by a rocky creek crossing (I suppose there used to be a bridge here)—to the obvious sign marked “trail entrance,” which directs hikers into the woods to the right. The route from here makes a relatively straight shot for Highway 267, better known as the Dulles Access Road. 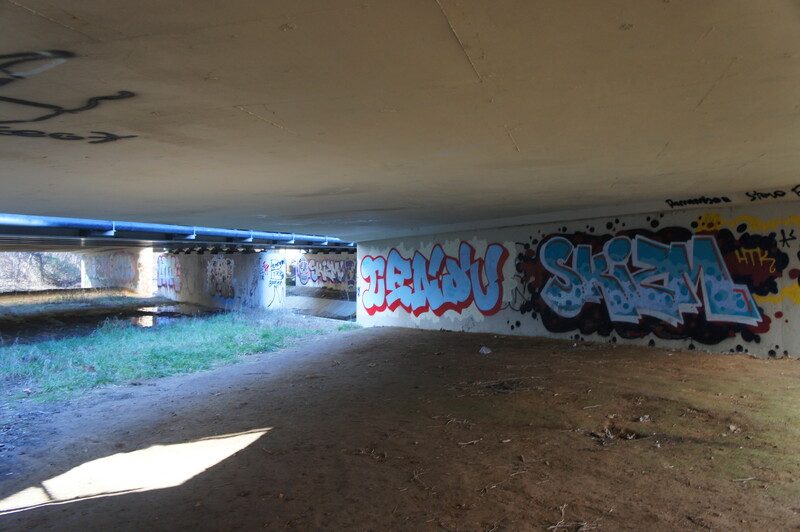 With the roaring traffic overhead, pass under the highway bridge, decorated with elaborate graffiti. The trail beyond can be quite muddy, but the county was kind enough to place some concrete stepping stones to ease what would surely be a mess for your boots. At a point 1/10 mile from the toll road—3.5 miles from the trailhead—the route splits. 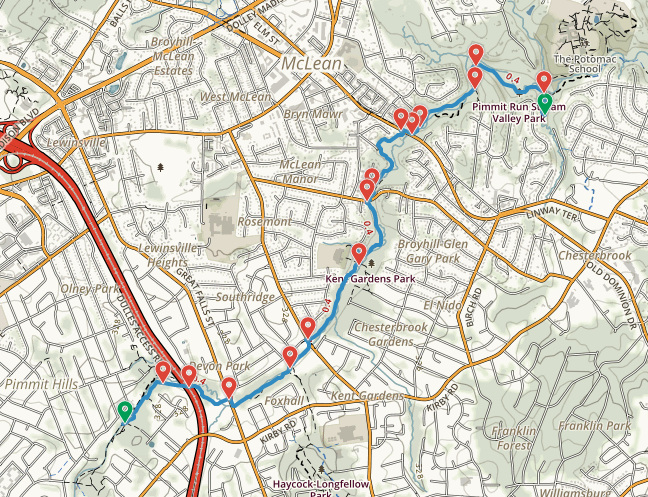 The right fork crosses Pimmit Run and ends at Olney Park. The left fork continues to follow Pimmit Run, ending unceremoniously in a guy’s backyard. It is possible from here to drop down to the stream—now a rather unattractive flow through a concrete chute—and continue upstream to Lemon Road Park. But for all intents and purpose, this is the end—time to turn around. Retrace your steps all the way back to Bryan Branch Road, a 3.8-mile walk that makes for about a 7.6-mile round-trip. Runners can probably do the entire out-and-back in less than an hour; casual walkers (like myself) should expect to devote between 2.5 and four hours, depending on pace and stops. 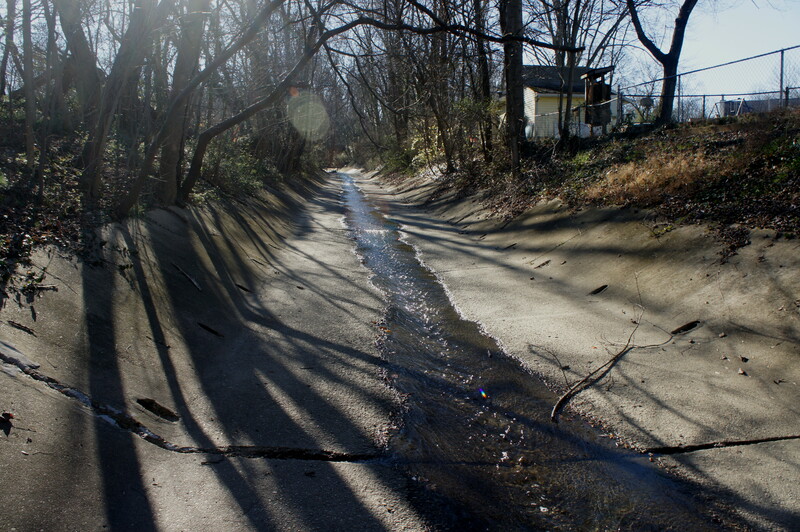 Having finished the longest Pimmit Run section, try the second longest, situated downstream between Solitaire Lane and Fort Marcy, near the stream’s mouth at the Potomac. 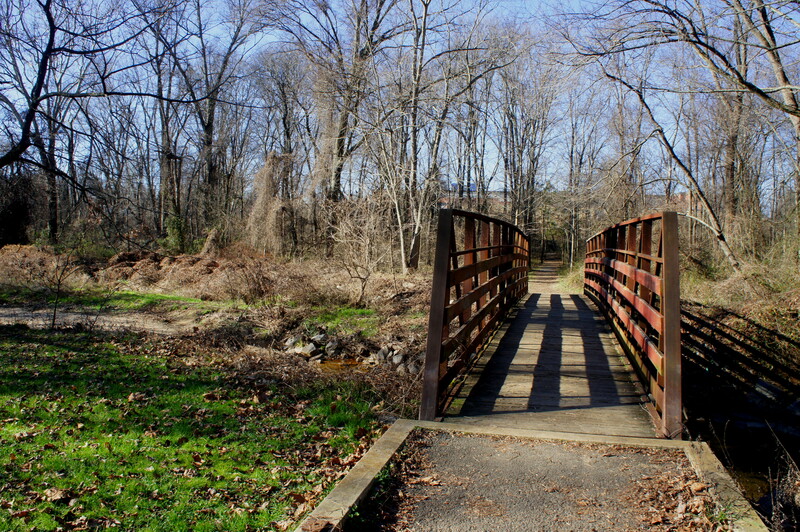 This entry was posted in Easy Hikes, Fairfax County Parks and tagged Bryan Branch, Dulles Access Road, Fairfax County, Kent Gardens Park, McLean, Olney Park, Pimmit Hills, Pimmit Run, Pimmit Run Stream Valley Park, Pimmit Run Trail, Virginia. Bookmark the permalink.